The cell. 6. Plastids. Atlas of plant and animal histology. Plastids are organelles found in plants and algae. They are the result of an endosymbiosis process that occurred during evolution. Plastids contain a double membrane envelope and inner membranes. Plastids are able to divide by growing and fission. 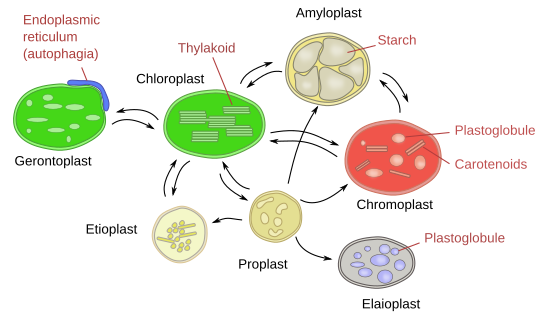 Main types of plastids are protoplasts, leucoplasts, chromoplasts and chloroplasts. Plastids are organelles found in plant and algal cells, although are also found in some marine animals. These organelles arose after an endosymbiosis process when a bacteria with photosynthetic abilities, similar to current cyanobacteria, was engulfed by an eukaryotic cell, and instead of be digested became an endosymbiont. During evolution, most of the genes of the engulfed bacteria were transferred to the host nucleus, and plastids developed a diverse set of functions: photosynthesis, amino acid and lipid synthesis, storage of lipids, carbohydrates and proteins, providing color to different parts of the body plant, sensing gravity, regulation of stomata behaviour, and many others. Plastids are limited by a double membrane and an intermembrane space. Inside, they contain other membrane limited compartments like thylakoids of chloroplasts and tubules of the chromoplasts. Like mitochondria, plastids also contain DNA and the needed molecular machinery to grow and divide, both processes under the control of the cell nuclear genes. Every plastid in a cell comes from another existing plastid, and are transmitted to the next plant generation included in gametes during fertilization. In this way, all the plastids of a plant are descendant of the embryo plastids, known as proplastids. Proplastids are also found in meristematic cells of adult plants, where they divide before the cell division to ensure a proper number of proplastids in the two new cells. When cell differentiation starts, proplastids also initiate their own differentiation program, so that different types of mature plastids are generated depending on the type of cell. They can be leucoplatids (elaioplastids, amiloplastids, and proteoplastis), chloroplasts and chromoplasts. Chloroplasts may also differentiate into other types of plastids and other plastids may differentiate into chloroplasts. It is a bidirectional differentiation path (see figure below). They are small plastids, about 1 µm in diameter, and less complex at structural level than other plastids of the plant. They are colourless, can change their morphology and may content a variable amount of tubular like internal membranous compartments, as well as starch depots. These features are shared by two types of proplastids: germinal and nodule proplastids. Germinal proplastids are found in plant embryos (in seeds) and meristematic cells. Their main role is provide, by division and differentiation. the rest of the plastids of the plant. They may carry out some metabolic functions such as giberelic acid synthesis, which is very important for meristematic metabolism. Nodule proplastids, as their name indicates, are found in the nodules of the roots and are involved in the fixation of nitrogen. Etioplasts, another type of plastids, are found in stems, but not in roots. They are a long-lasting intermediate stage in the way of differentiation from proplastid to chloroplast when there is very low intensity of light or it is dark. Etioplasts restart the differentiation toward chloroplasts as soon as the light is intense enough. Leucoplasts are colorless plastids (without pigments), that function as storage organelles. Leucoplasts comprise amyloplasts, elaioplasts (or oleoplasts), and proteinoplasts. They store starch, lipids and proteins, respectively. In plant cells, amyloplasts synthesize starch, and all the stored starch in a cell can be found in these organelles as starch granules. Amyloplasts, apart from storing starch, are gravity sensors in root cells. Starch granules are more dense than water so that amyloplasts fall to the bottom of the cell. These organelles interact with microtubules of the meristematic cells in a way that during cell mitosis the division plane is perpendicular to the gravity vector (which points to the Earth center). Amyloplasts are also involved in the metabolism of nitrogen<7span>. Elaioplasts are small size plastids containing oil and lipids in fat drops. In plant cells, there are two synthetic pathways for lipids. The eukaryotic pathway depends on the smooth endoplasmic reticulum, whereas the so-called prokaryotic pathway involves plastids. These two pathways produce different types of lipids. Elaioplast are also involved in pollen maturation. Some plants are able to store lipids in other organelles known as elaiosomes, which are derived from endoplasmic reticulum. Proteinoplasts contain a high concentration of proteins, so high that proteins form crystals or very dense amorphous material. However, it is not clear yet if there is a type of plastids dedicated exclusively to protein storage in plant cells. Chromoplasts contain carotenoid pigments that give the red, orange and yellow colors to the plant structure where they are present. These plastids are abundant in flowers, fruits, old leaves, and some roots. It is thought that one of their main functions is to attract animals for pollination or for spreading the seeds. Chromoplasts are metabolically active, though they contain fewer DNA copies than chloroplasts. Chromoplasts have lipid drops containing carotenoids and complex molecules known as fibrils, which also contain a core with carotenoids. 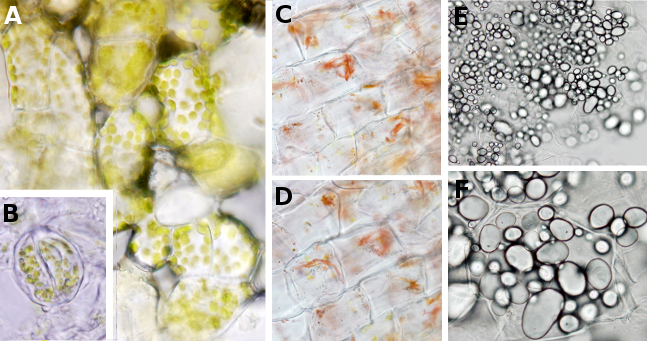 Chromoplasts are differentiated from chloroplasts, as well as from proplastids. During differentiation from chloroplasts, the photosynthetic machinery, mostly in thylakoids, is degraded and carotenoids are synthesized along with the compartments where they are going to be included. These compartments, known as plastoglobules, are lipid drops made up of mainly triacylglycerides that are located in the stroma. Carotenoids, mainly xanthophylls, are stored inside the plastoglobules, so concentrated that they can form filaments or crystals. Plastoglobules may be also found in other plastids. Chromoplasts develop an internal membrane system in the outer part of the stroma. These new membranes arise from the inner membranes and do not from the old degraded thylakoids. Carotenoids like lutein, beta-carotenoid, and others, may be also associated to these new membranes. Occasionally, the internal membranes show a reticular arrangement. Plastids. Chloroplasts (A and B). A) is photosynthetic parenchyma. A stoma is shown in B). Chromoplasts (C and D) from a tomato. Amyloplasts (E and F) from a potato. During chromoplast maturation, the concentration of pigments may be so high that they can form crystal, like beta-carotenoids in the carrot root, or lycopene in tomato. Carotenoids can also be grouped in tubular structures. Chromoplasts may contain other components such as starch granules and protein aggregates. Although chromoplasts have been considered an advanced stage of the chloroplast development, it has been observed that they are able to become chloroplasts again. Some root and fruit tissues may become green again. For example, lemon fruits which are left on the tree change the color from yellow to green, and carrot roots turn green when they are exposed to the light. Chloroplasts are the most abundant and studied plastids. They will be study in the next page. During aging and death periods, cells contain gerontoplasts, which are differentiated from chloropasts. Muroplasts are found in glaucocystophyta algae, and contain a vestigial wall of peptidoglycan located between the inner and the outer membrane of the organelle. Type S and T plastids have been found In the sieve cells of the phloem, and may respond to wounds. Rhodoplasts are photosynthetic plastids found in red algae, and contain type a chlorophyll, but not b or c chlorophylls. Rhodoplasts contain thylakoids not arranged in stacks, and also molecular aggregates containing red pigments known as phycobilisomes, which are able to capture the light wavelengths that reach long distances under the sea water. Finally, some animals eat algae and chloroplasts are incorporated into the animal cells instead of being digested. These plastids are able to photosynthesize during months, feeding in this way the animal (for example, Elysia chlorotica). These plastids are known as cleptoplasts. Furthermore, some parasites, like Plasmodium, may contain plastids known as apicoplasts.